This regatta is a real feast for the eyes and a showy weekend as to sailing. 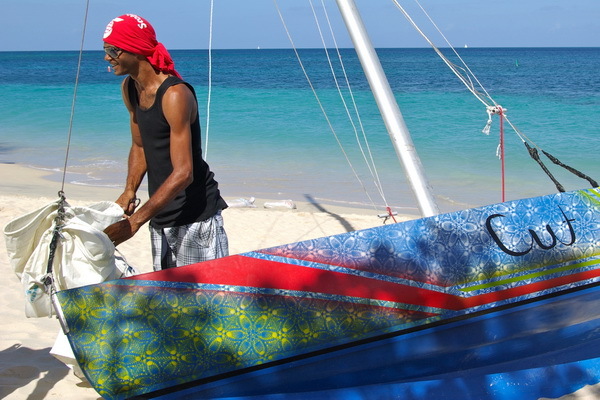 When we walked into Grand Anse Beach on Sunday morning a fleet of 39 workboats was lined up on the fine sand waiting to be rigged while the crews loudly discussed strategy. Traditionally these open workboats were made for fishing and some boats of the Community Class still had that look. Others were equipped with fully battened mainsails but all of them without a keel, which makes them quite cranky (if not more). Some crews filled sandbags and put them into the bilge. Sometimes more than just the foot of sail was dipping in and the sandbags made the boats look like submarines. The races start right from the beach with the crew inside the boat except for that one poor guy who has to hold the boat. The countdown is just 1,2,3 and then a short whistle. Poor guy has to run, to wade, sometimes to hang on the stern trying to get into the boat. Every man or lady has a job: at the tiller, the mainsail, the jib or bailing water from the bilge. Hiking out and keeping the boat in an upright position is an act of strength for all of them. Winning is not just touching the beach first; one of the crew has to jump from the boat, run to the committee tent and quaff a glass of rum. Nowadays coke is allowed too. One of the competitors once explained it like this: "Dis ain sail'n. Dis drink'n! I've seen it hoppen whey de boat finish firs but dey don win cuz de udder drinker fost'r." 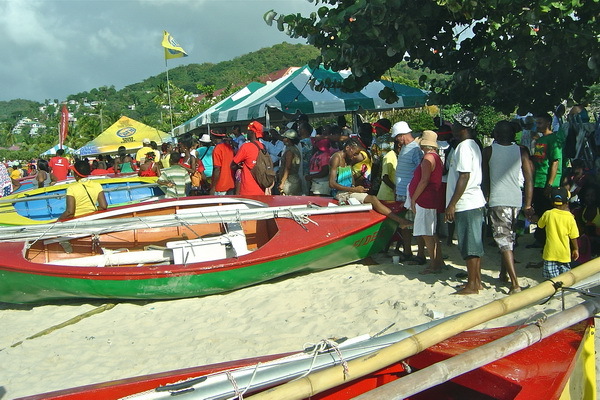 The beach was crowded, there were many stands with traditional food and drinks, the music was ear splitting and the announcer was shouting the action. Finally the Community Class winners race for the Champion of the Champions. Some boats are neck and neck. 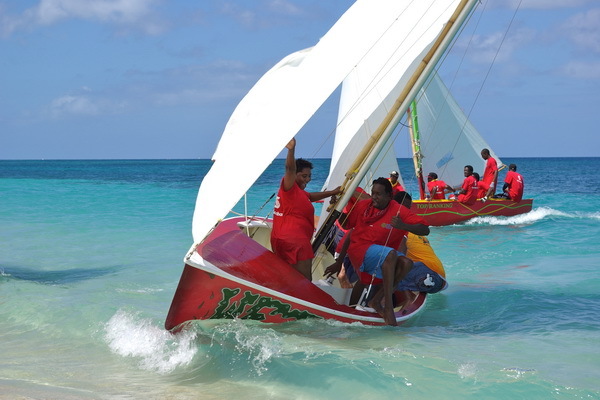 The winners jump out and the boat is upheaved to the beach by the enthusiastic crowd. Grenadian pride. Diese Regatta ist wahrlich eine Augenweide und ein Segelevent der Extraklasse. Als wir am Sonntagmorgen die Grand Anse Beach erreichten, lagen 39 Workboats aufgereiht auf dem feinen Sand und warteten darauf, aufgeriggt zu werden, während die Besatzungen bereits lautstark über Strategien diskutierten. Diese offenen Boote waren ursprünglich als Fischerboote gebaut worden; einigen Booten der Community Klasse sieht man das auch noch an. Andere sind mit durchgelatteten Großsegeln auf Rennen ausgerichtet; allen gemeinsam ist aber, dass sie keinen Kiel haben, was sie ziemlich „wackelig“ macht (manchmal auch etwas mehr als das). Einige Besatzungen füllten Sandsäcke und legten diese in die Bilge (für Nicht-Segler: der tiefste Teil des Rumpfes). Manchmal tauchten aber nicht nur die Unterlieks (untere Kante des Segels) ins Wasser ein, und dann liessen die Sandsäcke die Boote wie U-Boote aussehen. Die Rennen werden direkt vom Strand aus gestartet; die Besatzung sitzt schon im Boot ausser einem armen Kerl, der das Boot noch festhalten muss. Es heisst nur: „1,2,3,“ dann ein Pfiff, und der arme Kerl muss rennen, waten und manchmal am Heck hängend versuchen, sich ins Boot zu hieven. Jeder Mann und jede Frau hat eine klare Aufgabe an Bord: am Ruder, am Großsegel, an der Fock oder Wasserschöpfen. Für alle gilt als anstrengende Zusatz-Aufgabe: sich raushängen und das Boot aufrecht halten. Die Zuschauer waren sehr zahlreich, da standen viele Stände mit traditionellem Essen und mit Getränken. Die Musik war ohrenbetäubend und der Speaker kommentierte die Rennen lautstark. Zum Schluss dann das Rennen um den Champion der Champions, einige Boote Bug an Bug. Die Sieger springen vom Boot und dieses wird vom enthusiastischen Publikum auf den Strand getragen. Grenadischer Stolz. Das Rätsel dieser Woche findest du bei den Fotos!